The painting in its frame. 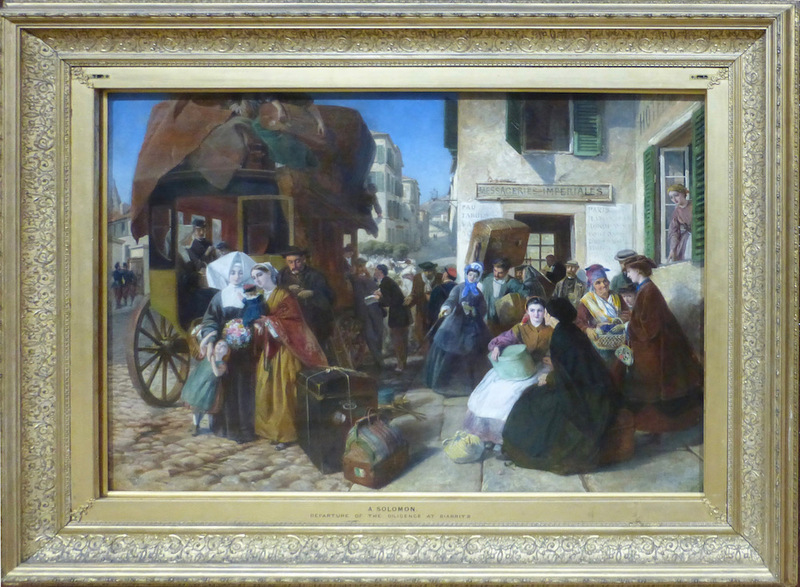 The various groups in this painting, mostly passengers boarding a public stage-coach stationed alongside the carrier company's office (Messageries Impériales), make up a little panorama of French life and types, from the nun in her habit, to a hawker — the peasant selling small items to departing travellers. It seems that Solomon, who had come to Biarritz himself for health reasons, and who must have been weak at the time, nevertheless could not resist painting such a picturesque scene, so full of human interest. There is no lessening of his usual care in the composition of the groups, or of his usual keen insight into the feelings of those involved. Since this was Solomon's last painting, it is possible that such partings may have struck an answering chord in him. It is a sadly appropriate subject for his own farewell. Close-ups. 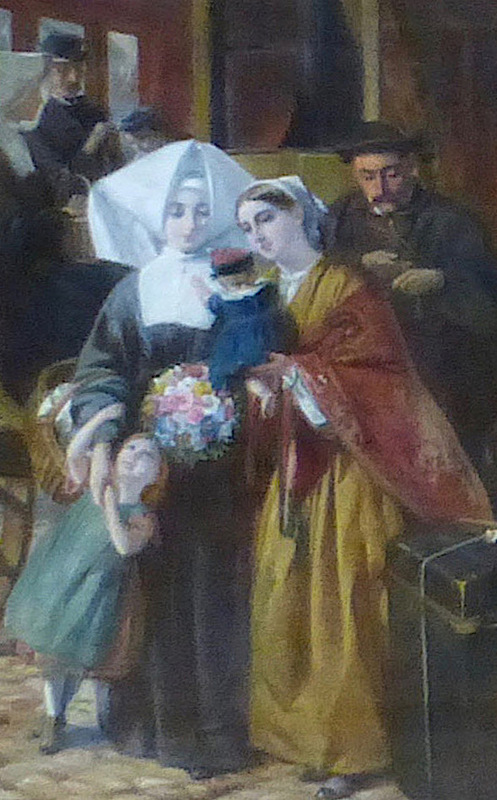 Left: A mother with two children who cling or reach out to a nun, probably their aunt. Right: A widow talking to a younger woman, while someone else, with her husband and son, makes a last-minute purchase from a street vendor. Solomon's own plight comes to mind most vividly in the case of the nun. The children are loathe to let her go, although she herself looks calm, composed and dignified, no doubt sustained by her religious calling. Others are not so emotionally involved: one or two (the furthest left is another nun) have already boarded the stage-coach, and the man on the pavement behind this group, on their right, looks at his watch impatiently. There are some more mundane interactions in space between the stage-coach and the office — where a clerk can be seen at work. In the centre of the painting, towards the back, is a woman in a blue bonnet, confidently showing a man where to put her trunk. Costume, of course, is an important guide to status, and she is the only one with this kind of bonnet. The there is another emotional scene in the foreground, on the other side of her. The woman in black here must be a widow. 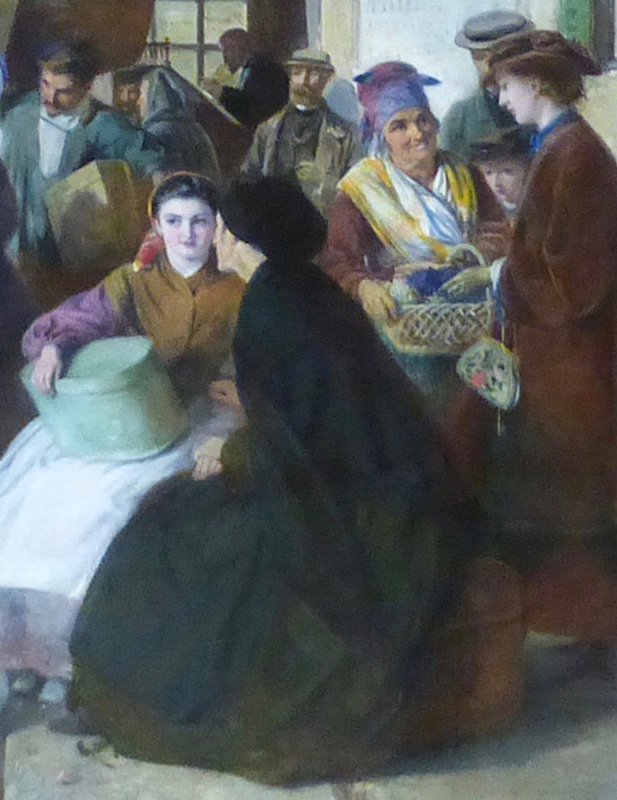 The younger woman seated beside her, in a white apron, might be her daughter, or a lady's-maid (or perhaps even a daughter going as a lady's-maid) to whom she is talking earnestly. The girl, however, seems to be looking forward, probably thinking of her future prospects. The onlooker at the window on the far right is watching the little business transaction taking place below her. But, as observers, we see the whole varied group in front of us, and sense the bustle of embarking on a long journey, which so often involves leaving loved ones behind. 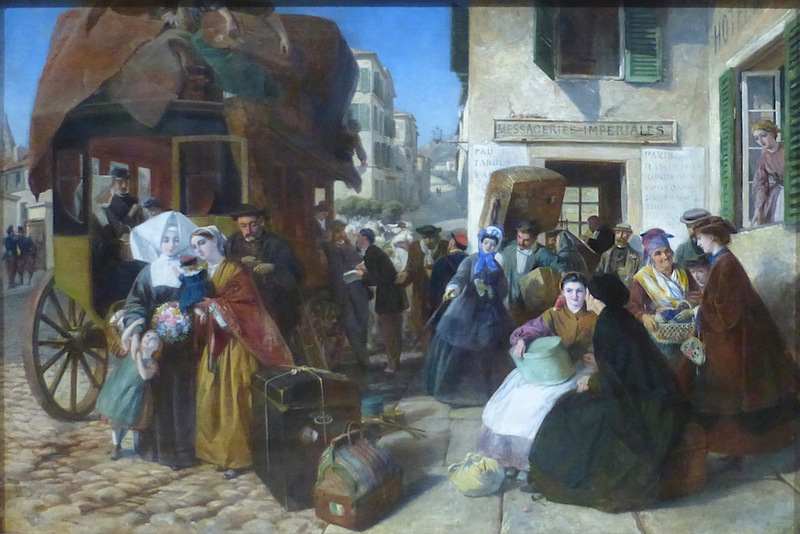 The Victorians had a taste for such scenes, now that travelling had become more common: in the same gallery hangs a much larger painting, William Frith's Railway Station, painted in the very same year. More dramatic events are taking place on the platform here (children being packed off to school; a bride, on the arm of her new husband, is taking leave of her bridesmaids; a pick-pocket is pursuing his profession; policemen are making an arrest, and so on). But Solomon's scene leaves more to the imagination, and is more subtle in this respect.